The Adventure Park at Storrs will donate $1 to the Arbor Day Foundation for every climber April 27 - 29, 2018. (PRLEAP.COM) The Adventure Park at Storrs, Connecticut, the popular outdoor zip line and climbing venue located at 2007 Storrs Road, is hosting its annual Arbor Day Weekend Event. For every climber at The Adventure Park from Friday April 27 through Sunday, April 29, 2018 it will contribute one dollar to the Arbor Day Foundation. For each of those dollars the Foundation will plant a tree. The Adventure Park sums it up simply: "You climb a tree, we'll plant a tree!" Since 2015, The Adventure Park at Storrs, along with the other Adventure Parks operated by the Outdoor Venture Group, have donated $11,600 to the Arbor Day Foundation from this program. This means climbers at these Parks have planted 11,600 trees in our national forests. 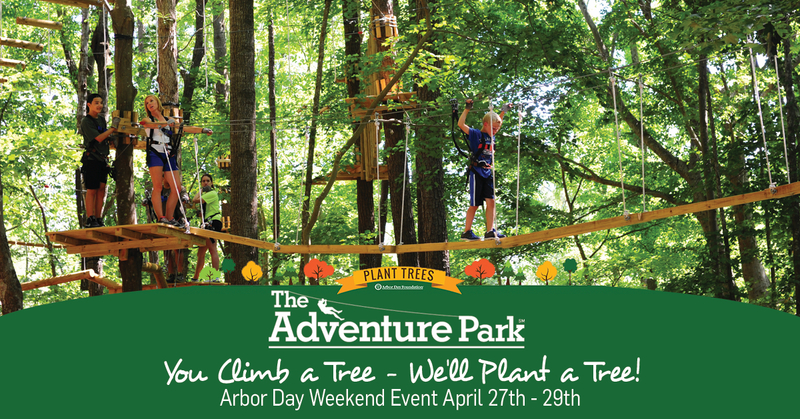 Tickets to climb during Arbor Day Weekend at The Adventure Park can be reserved online at the Adventure Park's website here. As always, The Adventure Park features its special combination experience of zip lines mixed with challenge bridges between the trees that keeps people coming back for more. The Park's friendly staff is available to answer questions and assist from the moment customers arrive to the moment they conclude their climb and return home with satisfied "I did it!" smiles. The Adventure Park is not one single aerial treetop trail but a variety of different, color-coded aerial trails of differing challenge levels—beginner through expert—that climbers choose from depending on their age or climbing experience. There are trails suitable for kids, teens, adults and families. These trails consist of platforms installed in the trees and connected by various configurations of cable, wood and rope to form "crossings" of different kinds including the ever-popular zip lines. Climbers wear harnesses which are doubly secured to safety cables using the Park's "always locked on" system of interlocking safety clips. Before venturing onto the trails climbers receive an interactive orientation and practice session. "Zip More – Zip Storrs!" The Adventure Park at Storrs is designed, built and operated by Outdoor Ventures. For further details and updates please visit www.StorrsTrees.com, email Info@StorrsTrees.com or call (860) 946-0606.